​How is danger defined by science? 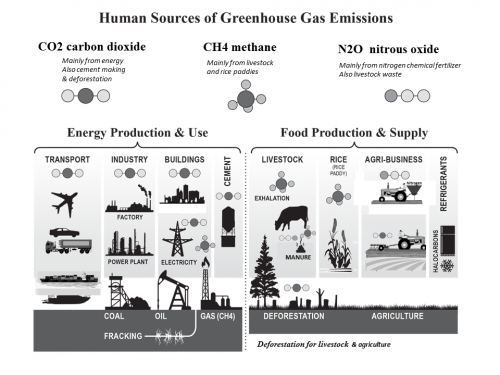 What are the big greenhouse gas pollution dangers? ​What is dangerous interference with the climate system under the 1992 UN climate convention​? ​What are greatest dangers from global climate change? 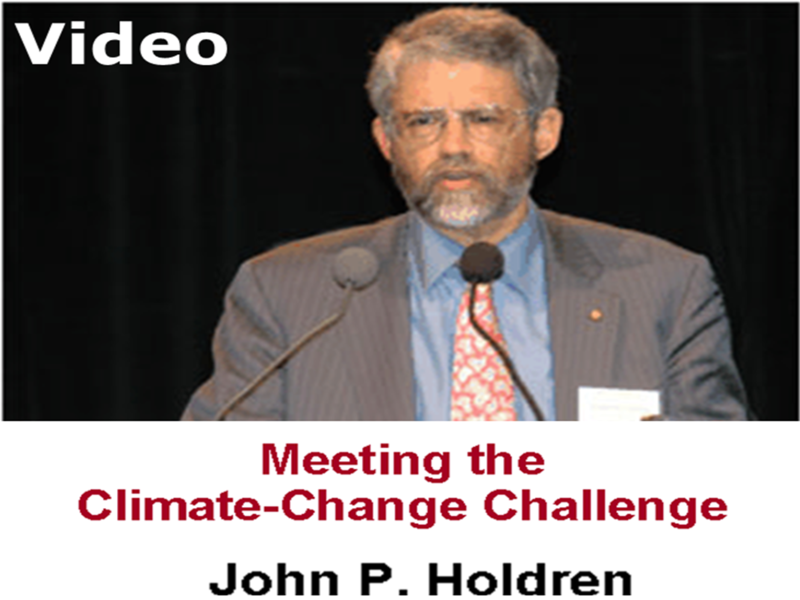 ​Starting in 2006 John Holdren (now science advisor to the US administration) has given a climate change lecture entitled Meeting the Climate Change Challenge in which he states and explains in full that the world is beyond dangerous interference with the climate system, under the clear intention and terms of the 1992 UN Framework Convention on Climate Change. He also states the question now is whether we can avoid catastrophic interference with the climate system that there is no guarantee that we can even if we take immediate action. Incredibly no nation, no scientific organization and no nongovernmental organization has put forward a public position, made a submission or presented a formal statement, that the world is beyond dangerous climate interference. The climate scientists, with just a few notable exceptions, have a long-standing and firm policy that they will not make a statement defining what dangerous climate interference is nor make statements or recommendations on the state of climate safety or danger. The reason that they give is that dangerous climate interference is a value judgment and scientists cannot make value judgments. The scientists say that only the "policymakers" (in the case of the IPCC scientists) or only "society as a whole" (in the case of the 2007 Copenhagen Climate Science Congress) can make such statements. The fact is that the government bureaucrats who sit on the IPCC have no climate science qualifications whatsoever and are in no position to make such recommendations to their governments. The international nongovernmental organizations take the position that they cannot draw conclusions on this issue ahead of scientists. Could global climate change bring about a planetary catastrophe? The possibility of abrupt climate change and/or abrupt changes in the earth system triggered by climate change, with potentially catastrophic consequences, cannot be ruled out. Positive feedback from warming may cause the release of carbon or methane from the terrestrial biosphere and oceans which would add to the mitigation required. How is danger defined by science? Danger is addressed by science as a risk. Risk is assessed as the product of probability when adverse consequence of impact with the magnitude of the impact. this is the definition approved by the IPCC. However the IPCC (incorrectly) claims climate danger cannot be determined by science -It is thus not possible to define a single critical threshold without value judgments and without assumptions on how to aggregate current and future costs and benefits (AR5 2013). The 2013 IPCC AR5 records many risks at a 1C warming and the AR5 Reasons For Concern illustration clearly shows warming above 1C is far too dangerous and 2C catastrophically dangerous. The IPCC Reasons For concern covers many impacts, except the greatest risk of all which runaway global warming caused by multiple amplifying feedbacks from large Arctic feedback sources. What is the 1992 UN climate convention? "The ultimate objective of this Convention and any related legal instruments that the Conference of the Parties may adopt is to achieve, in accordance with the relevant provisions of the Convention, stabilization of greenhouse gas concentrations in the atmosphere at a level that would prevent dangerous anthropogenic interference with the climate system. climate change, to ensure that food production is not threatened and to enable economic development to proceed in a sustainable manner. 1.​​“Adverse effects of climate change” means changes in the physical environment or biota resulting from climate change which have significant deleterious effects on the composition, resilience or productivity of natural and managed ecosystems or on the operation of socio-economic systems or on human health and welfare. natural climate variability observed over comparable time periods. What are greatest dangers from global climate change? B​y definition the greatest dangers​ are positive (amplifying) climate feedback, by which global warming from atmospheric GHG pollution causes more global warming, that is an increase in the rate of global temperature increase. There are very many such feedbacks. The largest source of feedbacks is the Arctic, which is now warming several times faster than the rest of the planet. All of these Arctic feedbacks are now operant. The ​greatest dangers to human populations or humanity are obviously water deprivation, food deprivation and health deprivation- and their combinations. They are all increased by global climate change and all fall under food security dangers. The worlds best food producing regions are in the Northern Hemisphere and since 2000 a number of badly damaging extreme weather events have hit these NH regions. The evidence for causation due to global warming plus Arctic amplification snow and sea ice albedo cooling is looking definite with recent research. 3. Extreme weather events​​ which is categorized as one climate change impact is extremely dangerous. Global climate change commitment ​​makes all dangers far worse than they seem today, making the above more than just dangers. The ultimate planetary tipping point would be so-called 'runaway'. Research July 2013 suggests, though unlikely' it could happen. To avoid confusion (see below) we suggest the term 'runaway climate chaos'. ​​For many years people concerned about global warming have referred to runaway global warming and climate change​. This is not a scientific term. It is used to convey the risk on a totally uncontrollable self accelerating global warming situation brought about by a very large positive feedback due to several different feedbacks boosting each other in a vicious cycle. The scientific term is abrupt, irreversible, rapid warming. The IPCC uses the term irreversible large-scale singularities. ​The other runaway scientific term is the runaway greenhouse effect. This is the ultimate planetary catastrophe leading to the super heated dead planet like Venus, and the experts are agreed that while a limited greenhouse runaway could be triggered it would not end all life. ​The term ‘‘tipping point’’ commonly refers to a critical threshold at which a tiny perturbation can qualitatively alter the state or development of a system (T Lenton). Here is an arrangement of the many dangerous impacts climate change. ​It may be a surprise that there are worse climate change dangers than disastrous sea level rise, which is far into the future, happens slowly and impacts are restricted to coastal regions. There are other dangers far greater and sooner. Note how the damaging impacts interact making all things worse​. 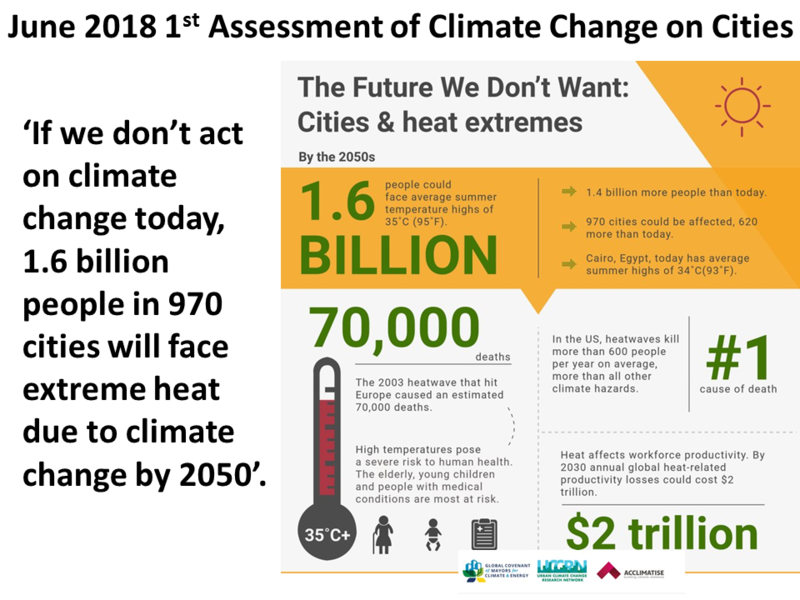 2C The 2C so called danger limitThe 1996 EU 2degrees C target is clearly now a target for catastrophe, and the EU has always said it is a compromise and not 'safe', which was stated and clear in the EU's 2008 science assessment of 2C . Now in 2013 the first paper is published to show that is true, by applying the terms of the UN FCCC(below)'Allowable carbon emissions lowered by multiple climate targets' is published; see Limiting Global Warming Is Not Enough. gases in the atmosphere endanger public health and public welfare. greenhouse gases, but this is seldom recognized. The objective of the 1992 Framework Convention on Climate Change is to avoid dangerous *anthropogenic interference with the climate system )*human caused. The 2C target dates back to the EU in 1996 and the EU has always said it a policy compromise that cannot be considered safe. For year the most climate change vulnerable nations at the UN negotiations have compalined they could not survive 2.0 and the danger limit has to be under 1.5C. At the 2010 UN Cancun Climate Conference it was agreed to have an expert team look at 2.0C and 1.5C as danger limits. ​Subsequently the UNFCCC Sec. called this a Structured Expert Dialogue and the findings were published February 2015 for the Geneva meeting. A May 2015 analysis of the report makes it clear that 1.5C is far preferable than 2.0C, and the understanding is that while 1.5C is now a tall order it must be kept open as a possible limit. ​The IPCC does not assess if climate change is dangerous- that is left to governments. (​25 Mar 2016 Top scientists find it hard to make public see risks). March 28, 2016 Will climate change leave a bleak future for humanity? Following the 2015 UN Paris Agreement the old 2C limit (certain catastrophe) has changing to 1.5C, but 1.5C is still globally disastrous. James Hansen published evidence for 1C danger limit and today (2018), which is certainly right and we are at 1.1C (2018). COMMITMENT Commitment Fundamental to dangerous climate change is today's commitment (see page), that determines already locked-in future global change will inevitably be much higher than today's degree of climate change. Commitment is due to climate system inertia (mainly ocean heat lag) and momentum. A good example ​ is his A New Age of Risk presentation. ​ot only by a climate change assessment. 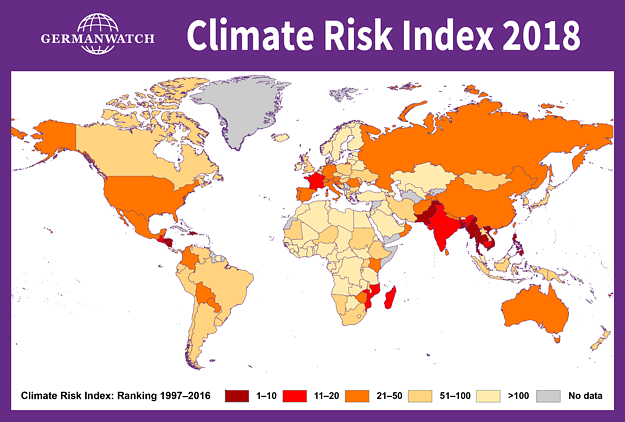 The IPCC refers to risk but does not in fact apply risk to the assessments. 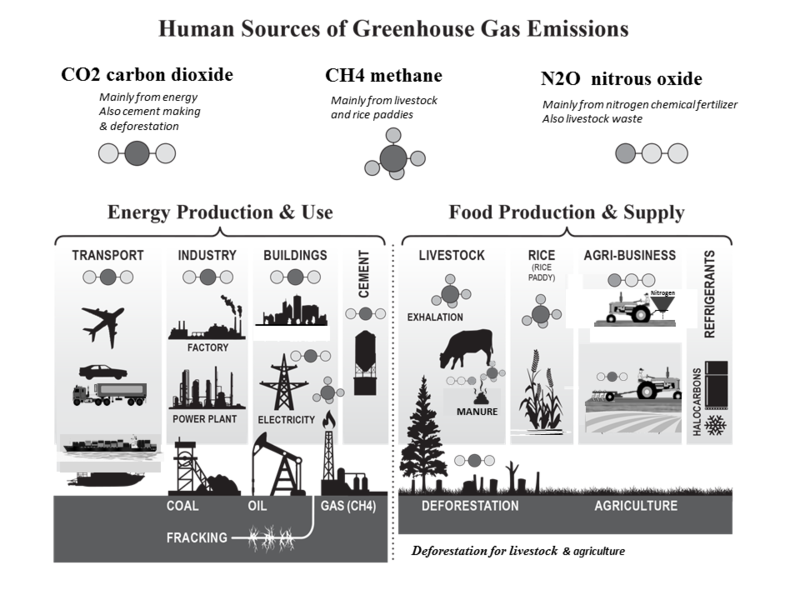 Sources of GHG emissions ​​The dangers of atmospheric greenhouse gas pollution, are from the greenhouse gas emission sources. The health of human populations is (should be) assessed by the long established standard environmental health risk assessment. The environmental health risk assessment addresses all the sources of all the pollution and the health risks of their source based impacts, of which a greenhouse gas emissions are a part. Presently that is large but still a small proportion of the total pollution health impacts and risks. ​​Small children are the most vulnerable, followed by the elderly and the infirm. ​of the human race surviving on an increasingly inhospitable planet.